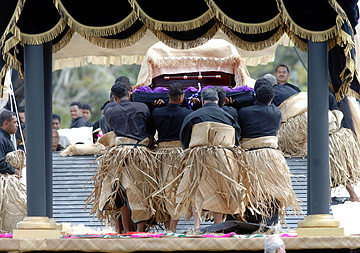 The casket bearing King Taufa'ahau Tupou was carried to his final resting place at the royal tombs in Tonga today. NUKU'ALOFA, Tonga » Tonga came to a standstill today as the tiny Pacific Island nation buried its beloved King Taufa'ahau Tupou IV in an elaborate state funeral that mixed tribal traditions with Christian prayers, royal pomp with village-style feasts. Led by his son and successor, King Siaosi Tupou V, dignitaries from 30 nations lay wreaths and joined an estimated 10,000 people in a Wesleyan Christian funeral service at the Tongan Royal Tombs, Mala'e Kula. One thousand pallbearers escorted the coffin on its 500-yard journey from the royal palace to the funeral site as mourners lining the route sat silently. 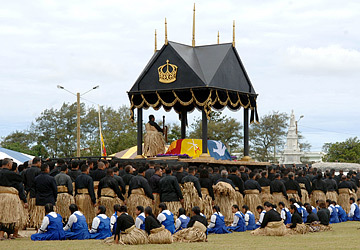 Tongans dressed in black and wore traditional mourning mats called ta'ovala wrapped round their waists. Tupou IV died at age 88 in a hospital in the northern New Zealand city of Auckland on Sept. 11, plunging this nation of 114,000 into a month of official mourning. His body was flown back to the kingdom Sept. 14 to lie in state. In the Tongan capital, Nuku'alofa, black and purple mourning cloth festooned buildings, roadsides, and even palm trees, marking the biggest royal funeral since 1965 when Queen Salote, Tupou IV's mother, was buried. Japan's Crown Prince Naruhito, the Duke and Duchess of Gloucester representing Britain's Queen Elizabeth II, the prime ministers of New Zealand and Fiji, the President of French Polynesia and governors general from Australia and New Zealand were among international dignitaries. The catafalque bearing the casket of King Taufa'ahau Tupou IV moved up Kings Road to Lauaki, the Royal Burial ground for his entombment today in Nuku'alofa, Tonga. The tiny Pacific Island nation came to a standstill as it buried its beloved king. Church groups began singing hymns last night and continued until dawn today. Surfboard riders stashed their boards in respect to a king who was himself a surfer. Government and many private businesses closed for the day. During the lying in state, thousands honored their beloved king, many bearing traditional gifts of huge woven mats, baskets, fabric and painted tapa cloth made from the bark of the paper mulberry tree. Gifts of food have also flooded in to feed thousands of mourners in the capital where huge earth ovens, or umu, lined with hot rocks have been used to cook it. As the funeral procession passed, hundreds of school students who lined the path sat silently. Crowds of other Tongans sat under open-sided marquees lining the route. The service included traditional rites as well as Christian prayers. At the burial site, 40 men assigned as undertakers, or nima tapu, lay the king in the royal tomb. Mourner George Hurrel, who attended the funeral of Queen Salote, who is still a much loved figure in Tonga, said today's funeral, and the nation's sense of loss, was just as great. "We loved Queen Salote as much as we do our king," Hurrel, 75, said. Tupou IV's 41-year reign made him one of the world's longest-serving sovereigns, after Thailand's King Bhumibol Adulyadej, Britain's Elizabeth and Samoa's King Malietoa Tanumafili II. Although Tupou IV was criticized as too autocratic toward the end of his reign, Tongans credit the late monarch with transforming the poverty-ridden nation from a village-based economy to a regional and international trade economy.